The Supreme Court allowed us to file a reply to the government’s opposition to our motion for an emergency stay of the ATF bump stock ban, which we filed at noon today. Today our firm filed an emergency application for stay with the U.S. Supreme Court (directed to Justice Sotomayor, Circuit Justice for the Sixth Circuit), requesting that the Court stay the effective date of the ATF’s Final Rule banning bump stocks pending review of the case by the Sixth Circuit. Today our firm filed a 28(j) letter with the Sixth Circuit, citing additional information in the D.C. Circuit cases of Guedes and Codrea. We point out that although the courts have issued stays in these and similar cases, the stays only apply to the specific appellants in each case, and do not grant the nationwide relief to bump stock owners being sought by Gun Owners of America, et al. At 5:00 today, the Justice Department opposed our petition for emergency relief in the Sixth Circuit. At 10:30 tonight, we filed our reply to their opposition. The Sixth Circuit granted leave to file our reply brief. The ATF reclassification of bump stocks as machineguns will take effect on Tuesday, March 26. The federal district court in which we challenged this classification change has yet to rule on our motion for an injunction. Therefore, we were forced to file this emergency petition in the U.S. Court of Appeals for the Sixth Circuit. Today we submitted another set of comments to ATF opposing its Notice of Proposed Rulemaking which would reverse long-standing ATF policy to determine, in violation of federal law, that a “bump fire” stock constitutes a “machinegun.” Our comments were filed on behalf of Gun Owners Foundation. Earlier, on January 18, 2018, we filed comments for GOF on the ATF’s Advance Notice of Proposed Rulemaking. Today, we submitted comments to ATF on clarifying whether “bump fire” stocks fall within the statutory definition of “machinegun.” Our comments were filed on behalf of Gun Owners Foundation. Today, our firm filed comments on behalf of Gun Owners of America, Inc. and Gun Owners Foundation, expressing opposition to the ATF’s continuing effort to require federally licensed firearms dealers (FFL’s) to report to ATF information regarding the sale of multiple rifles. Purportedly concerned about firearms being trafficked to Mexican drug cartels, about six years ago ATF created a new requirement that all FFLs located in the four southwest border states (California, Arizona, New Mexico, and Texas) must report to the ATF any sale to a single person of two or more rifles within a five day period. Today we filed an amicus brief in the U.S. Supreme Court, asking that Court to review a decision of the Fourth Circuit which would strip the Second Amendment rights of Marylanders. In purchasing his suppressor, Mr. Kettler had relied on the Kansas Second Amendment Protection Act which states that a firearm or firearm accessory (such as a suppressor) that is manufactured, owned, and kept entirely within the borders of Kansas is not subject to any federal law. When Mr. Kettler revealed that he purchased such a suppressor, however, agents from the Obama Bureau of Alcohol, Tobacco, Firearms, and Explosives (“ATF”) swooped in to make an example of Mr. Kettler, and his co-defendant Mr. Cox. In our brief, we argued that the NFA is unconstitutional. Although for many decades, courts (including the Supreme Court) have upheld the NFA under Congress’ power to tax, times have changed. Today, the NFA is the only “tax” that is not administered by the Treasury Department, but rather by ATF — part of the Department of Justice — responsible for enforcement of federal law. What’s more, while normal taxes are crafted to ensure that people pay them, the NFA “tax” is crafted to ensure that as many people as possible are disqualified from paying it, and as many weapons as possible are disqualified from registration. That hardly sounds like a real tax. Next, we noted that in 1934, registration of an NFA firearm was relatively simple, while today it is a regulatory nightmare, indicating that today the purpose of the NFA is regulation, not taxation. Finally, we noted that while the NFA in 1934 actually produced tax revenue, its “taxes” have never been raised from $5 and $200, and thus today it produces no net revenue — and in fact is a huge drain on federal resources. How can the NFA be a “tax” when its net effect is to cost the taxpayer tens of millions of dollars annually? Next, we argued that even if the NFA is considered a tax, then it is an unconstitutional tax on the constitutionally protected right to keep and bear arms. As the Supreme Court has held, in order to validly tax a constitutional right, a tax must not be a general revenue tax, but instead must be tied to defraying the expenses of administering the program. However the NFA “tax” is paid directly to the Treasury Department, and is not used by ATF to fund the administration of the NFA. And since suppressors are owned and lawfully used by millions of law abiding Americans, they are clearly protected “arms” under the Second Amendment’s protection. Next, we noted that Mr. Kettler’s prosecution is not an ordinary criminal prosecution, but rather a constitutional dispute between two sovereign entities — the federal government and the State of Kansas. As such, the federal government should have resolved this dispute directly with the State of Kansas, rather than going after Mr. Kettler, the low hanging fruit. This case raises important constitutional questions about the scope of federal power, and its proper resolution is between the United States and Kansas — not between the United States and Mr. Finally, we noted that in this case, Mr. Kettler had no sort of typical “mens rea” or “guilty mind” indicating he intended to violate the law. Rather, it is undisputed that he was attempting to follow the Kansas law, and that he believed (even if mistakenly) that what he was doing was lawful. For the Court of Appeals to permit his felony conviction to stand under such circumstances is indefensible. 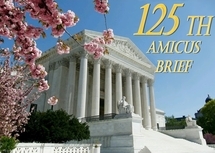 Today, May 30, 2017, we filed an amicus brief in the Connecticut Supreme Court in support of gun manufacturers Bushmaster and Remington, who had been sued by the families of the Sandy Hook school shooting victims. The plaintiffs in the case had brought a “negligent entrustment” claim, arguing that the AR-15 style rifle should never have been sold because it was foreseeable that it would be used in the crime. However, as we pointed out, neither the manufacturer, distributor, nor dealer did anything wrong with respect to this particular sale — the essence of a legal negligent entrustment claim. Rather, the Plaintiffs instead were making the policy argument that generally no one should ever be permitted to sell any AR-15. In other words, they were asking judges to legislate to ban AR-15 style rifles. Our brief also dispelled the false claims made by the plaintiffs’ attorneys about AR-15 style rifles. They had argued that AR-15s are “so powerful,” yet as we pointed out, the .223/5.56 cartridge is on the low to medium end of most center-fire rifle calibers. The plaintiffs had argued the AR-15 is “so accurate” that it’s not even necessary to aim, but we argued that the platform is not any more inherently accurate than most other modern rifles, and in fact the lightweight bullet means other calibers far outclass it at distance. The plaintiffs had argued that the AR-15 is “so destructive,” yet as we argued, it doesn’t hold a candle to most other popular calibers like the .308 and the .30-06. Finally, the Plaintiffs had argued the AR-15 is a “feat of human engineering.” Of course, the AR-15 is a well designed and popular rifle, but it’s nothing more than the latest in a long line of advancements in firearms technology. When the semi-automatic firearm, the lever action firearm, and the breech loading firearm were developed, each one was capable of much greater firepower than the firearms which proceeded them. Yet no one wants to ban the lever action .30-30. The Sandy Hook shooting was a terrible tragedy. But the AR-15 is not to blame. Neither is Remington, Bushmaster, the distributor, or the dealer who lawfully and responsibly sold one to Adam Lanza’s mother years before her son murdered her, stole her firearms, and used them for evil. Today, we filed our second amicus brief in this case, in support of a petition for rehearing en banc in the U.S. Court of Appeals for the Fourth Circuit. We urged the Fourth Circuit to rehear the case, because the panel decision ignored the requirements of the U.S. Constitution’s Full Faith and Credit clause. The issue involved a Maryland resident’s right to purchase and possess firearms despite the judicial removal of disability to own firearms by a Virginia court after a Virginia conviction. Today we filed a brief in the U.S. Supreme Court in support of the petition for certiorari filed in the Peruta challenge to California concealed carry laws. Our brief, however, urged the Supreme Court to grant certiorari to review a broader issue than that sought by the petitioners, and based on a more robust understanding of the protections afforded by Second Amendment than that urged by petitioners. We had previously filed another brief in the Peruta case on April 30, 2015, in the Ninth Circuit during its en banc proceeding. Today, our firm filed comments with the Bureau of Alcohol Tobacco and Firearms (“ATF”) in response to the ATF’s proposal to combine the federal application to be a firearms dealer (“Form 7”) with the application to be a Collector of Curios and Relics. As our comments pointed out, ATF’s proposed new combined form is an attempt to combine apples and oranges. Dealers (businesses) are nothing like collectors (private persons). The proposed form is complicated and unclear as to which sections apply to which license. Moreover, the proposed form eliminates current language which is helpful to a person knowing whether or not he needs to apply for a license. Our comments were filed on behalf of Gun Owners of America, Inc. and Gun Owners Foundation. Today our firm filed comments on behalf of Gun Owners of America, Inc. and Gun Owners Foundation opposing the proposed changes to the Form 4473, a form ATF claims continues to be necessary, though it is not required by any federal law. Our comments explain how the proposed additions to the Form 4473 are unnecessarily confusing and often unauthorized. The form is already complex, presenting a legal hurdle for law-abiding Americans wishing to exercise their Second Amendment right. If ATF does not eliminate the Form 4473, it should, at a minimum, seek to simplify rather than further complicate the form. Today our firm filed comments on behalf of Gun Owners of America, Inc. and Gun Owners Foundation opposing proposed regulations issued by ATF to require not only firearms dealers, but also manufacturers and importers, to certify that secure gun storage or safety devices are maintained anywhere firearms are sold. Our comments explain how ATF’s proposed regulations would purportedly “implement” provisions of federal law; however, the regulations would actually rewrite federal law to further the goals of ATF.